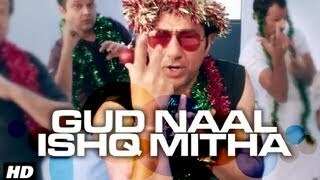 Gud Naal Ishq Mitha Lyrics from Movie I LOve Ny (New Year), sung by Tochi Raina and composed by Anupam Amod. Gur Naal Ishq Mitha Lyrics are penned by Mayur Puri. Kaun jaane kisko hai pata haaye..
Ke gud naal ishq mitha oye hoye. Ke gud naal ishq mitha aaye haaye. Ho gud naal ishq mitha..